Ghassan J. Sader, founder, and CEO of Sader Hospitality Worldwide, LLC, is a graduate of the prestigious Institut International de Glion of Montreux, Switzerland. Following graduation, he subsequently attended Cornell University and completed special courses in the Professional Development Program "PDP" on a scholarship program. Mr. Sader is an expert at evaluating all facets of a hotel. From the quality of the staff, daily operations, marketing plan, architecture, and engineering to an asset’s standing in the marketplace and its overall food and beverage department, Ghassan is an industrious professional who pours himself into every project Sader Hospitality Worldwide takes on. Over Sader’s Career, he has managed and consulted for hotels in the United States, Canada, Switzerland, Japan, Eastern Europe, Central Asia, The Middle East and The Arabian Gulf States. 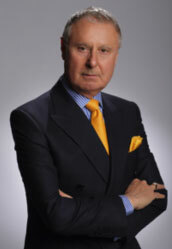 He has worked for numerous hotel chains including Hilton Domestic & International, Sheraton Hotels, Intercontinental, Omni Hotels and independent boutique hotels in the United States and Canada, a Castle in Japan, opened and managed Beach Club Resort in Baku/Azerbaijan, assessed/evaluated seven hospitality assets in Croatia, and consulted and opened a resort on an island in the Middle East on the Red Sea. With an emphasis on financial analysis, business plans, profit and loss responsibilities, pricing strategies, sales and growth, Ghassan is a cost-efficient problem solver. Resourceful, motivated, persuasive and sensitive to the myriad needs of each SHW property, Ghassan effectively utilizes information, establishes priorities, coordinates projects and foresees problem situations. All while meeting and exceeding highly stringent objectives. Sader founded Hospitality Asset Services, LLC in 1995. In 1997, Sader changed the name to Sader Hospitality Worldwide, LLC and continued providing consulting and asset management services for more than a dozen hotels throughout the United States, Japan, Eastern Europe, Central Asia and the Middle East. Specializing in operations and how to efficiently manage a property on a day-to-day basis, Ghassan has been involved in projects of up to $500 million. Currently, he is responsible for the daily operations of all SHW assets. Working closely with owners, Ghassan strategically sets management goals and oversees the implementation of new business plans down to the smallest detail. When necessary, Ghassan will even remain on location until an asset is stabilized and producing maximum cash flow. He has an extensive list of properties that he has managed and turned around successfully. Sader Hospitality Worldwide, LLC, is based in Los Angeles, CA, and was created to provide exceptional management and consulting services to the hospitality industry. Sader is a regular speaker or panel participant for industry-related conferences and universities. It's Ghassan J. Sader's superior ability to effectively initiate, direct, and effect change that has made Sader Hospitality Worldwide LLC the premier hospitality and hotel management company in its discipline. Sader is a member of the Los Angeles Bankruptcy Forum, the Turnaround Management Association, California Receivership Forum and a former member of the Los Angeles Hotel Association.